My Mum has been staying with us for the past 4 weeks and leaves on a flight back home to London this evening. She managed to squeeze in (there is great irony in those words – we love to shop! ), a little Christmas shopping while she was here and there is a fantastic present perfectly wrapped up for someone special here in her hand. The question remains… what is it… and who is it for…?!? This photograph was taken at 3 o’clock this afternoon with the light streaming in from the window behind her in our family room. The ISO was set at 160, shutter speed at 1/60, and aperture f/1.4. 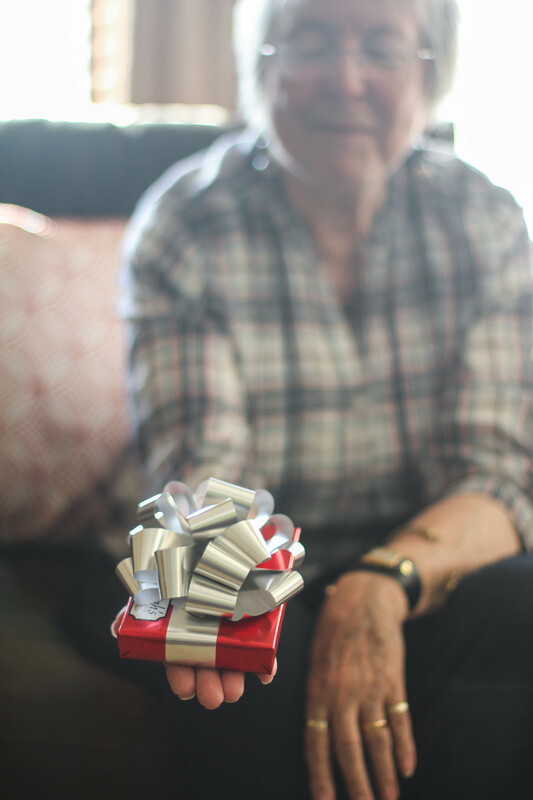 With her hand stretched out I could focus on the perfect little gift and blur out the background. Post-processing in Lightroom was quick and minimal. I decreased the temperature a little, and the highlights. I increased the clarity, contrast, and sharpening. It’s official! 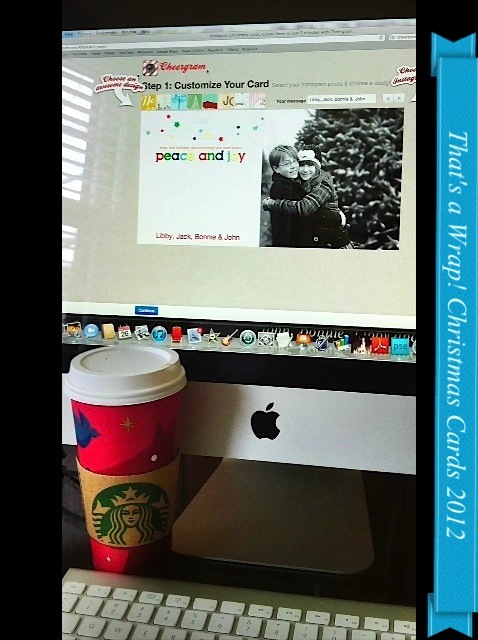 I am all ‘wrapped up’ with my 2012 Christmas Card order, and here is a photo to prove it! And for all my fellow Instagramers, listen up. Cheergram is the way to go for your cards this year. This was such a fun, easy and inexpensive process to create a personalized trendy card. Simply log into your Instagram account on the Cheergram sight, and all your IG photos will automatically load, along with eight different Holiday designs to choose from. Type in your personal message and you’re done. It’s THAT simple. I should be receiving my order in 2 to 3 business days and I’m very excited to see the finished product.